Love this, and we do many of these, too. We are also far away from grandparents/relatives (not that it's *always* a bad thing . . . ahem). My MIL does video chats with us, and although she's not on FB I send her the links to any pictures I post. My parents, however, are not computer savvy at all. We did a video chat once or twice when they were at my brother's house, but it was all very Jetsons for them. So, about once every month or two I upload photos to walmart.com and have them mailed to their house. (You can have them sent to a local store and picked up, but really the postage is minimal.) They won't get on a plane, so we haven't seen them in two years. Sigh. Anyway, loved the post . . . lots of good ideas. Hubby does the story reading before he deploys. We do lots of phone calls on speakerphone. I like speakerphone better than webcams because then my mom can't tell that I'm nursing my toddler in my pajamas even though it's like noon, or that there's a giant pile of dirty laundry sitting right behind me, etc. lol. I feel like I have to get ready for a video chat like I would for a playdate or something, and make sure the house and my son and I look nice. My mom got Twitter after I told her for the bazillionth time about some prize I'd won, but I don't think she really gets it. She still has an egg for a picture, several months later. Oh and one more random thought I had-a lot of stores like Walmart and Walgreens have the ability on their website for you to upload and order pics to be printed at a store, pay online, and then pick any store you want. So I've done that before and I paid with my credit card, but had them printed and sent to the store where my parents shop regularly anyway, and told them when they were ready! I love this post! My inlaws live across the ocean from us, so we've always had to rely on the technology. I take a TON of photos, and share them via Picasa. We Skype almost once a week, too. And now that AT&T got some decently priced packages for texting internationally, I can send photos and the infrequent video (all the kinks aren't worked out yet). Whenever a package arrives at the house, my daughter asks, "grandma?" :) It's such a great idea to remind them who gave them a present in general. Whenever we brush our teeth she says, "Laura toothpaste" since my sister Laura gave her the toothpaste at Christmas. Obviously that tube is gone now- but she'll probably forever think Aunty Laura supplied her toothpaste! Those are a lot of suggestions! 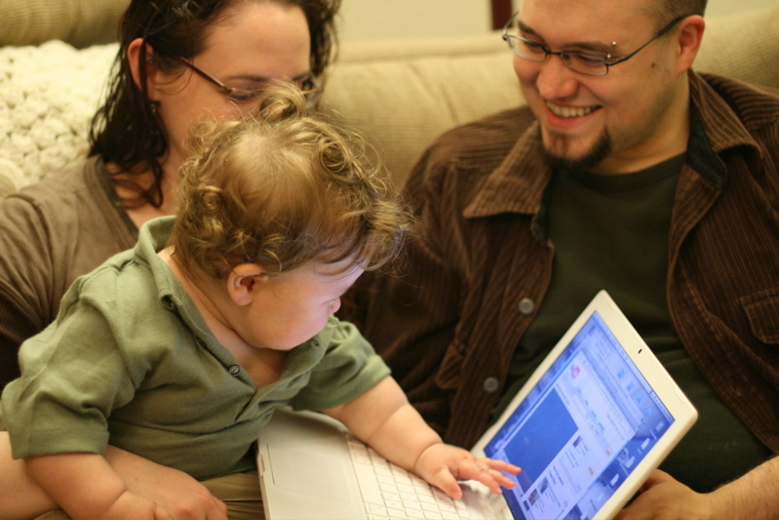 I think the older the kids get, the more resources you need to keep in contact because the kids will be more involved in communicating as well. My in-laws live in Germany, and so far, we've chatted on Skype (only once or twice a year), I've started a family blog (which they all love), and I send pictures and/or art work with their birthday cards. We have the goal to see them personally every year. I think while my in-laws aren't "too old" to travel internationally and we have at least one young child, we can fly over there every other year (hoping they come over here the opposite years.) When the kid(s) are older we can go every year. I guess we'll see what happens! The long distance is hard on my mother-in-law but it also makes the visits a lot more special. I love the idea of sending the pictures to THEIR store! Next time I'm motivated to at least get the pictures ready, I'll give that a try. That will at least save me finding an envelope and stamps! @Cassie: That's why my dad got an iPhone, too. :) Before realizing that I don't have video chat on my phone! But we solved that by having me chat on my laptop, so all is well. "Technology grandparent heaven" — priceless. @lovenotesmama: Laura toothpaste — that's so sweet. I love the connections kids make to little things like that, and it's so easy for us to keep that up with them if we just think about it. My mother in law lives 2200 miles away, and she has no computer and is homebound, so this has been a real challenge. We have subscribed to a service called Presto. She has a little Presto machine at her house and every few days we can log into the Presto site and upload a photo, some words, etc., and it will print out on her Presto machine. She loves getting new photos on her machine. I read this post hoping to learn something but found I actually do most of the suggestions anyway. I'm the grandparent-on-the-other-side-of-the-ocean and just wish my daughter had a webcam on her laptop! My son-in-law has one so we can connect using video sometimes, as opposed to on the phone or skype audio. I've bought a USA Skype phone number so my daughter can phone me (in England) without it costing her extra money. I also have a subscription to call USA phones via Skype so it costs very little money to call her cell phone. Of course Skype-to-Skype is free. Christmas day seemed like my other daughter and I were in their living room as they opened presents and we were just conversing as if we were there - and sometimes just observing as you do when you are all in the same room. I only ever print photos through flickr, and only usually when it's going to be mailed directly to a great grandparent. Fortunately our parents are all internet savvy enough to be able to print their own pics from my Flickr account. My toddler would totally dig hearing her Abuelitos read her a story. Making a recording seems doable. I've got to try this. 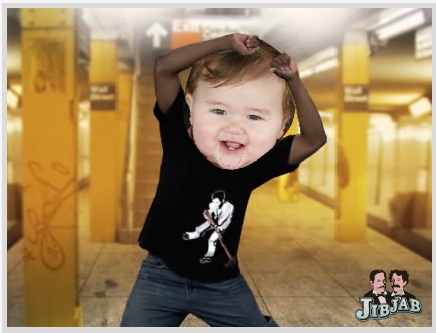 I just peed myself over the JibJab video. Love that! This was a very timely post as I have been trying to find ways to help Tiny stay connected to her grandparents and aunt who are 8 hours away. We see them half a dozen times per year but I want her to grow a relationship with them now that she is old enough to do so. There are all some really creative and practical suggestions. We already do Skype and pictures. Tiny send artwork. We call a lot. But your list opens some new doors for us to have fun with! Thanks for all these suggestions. 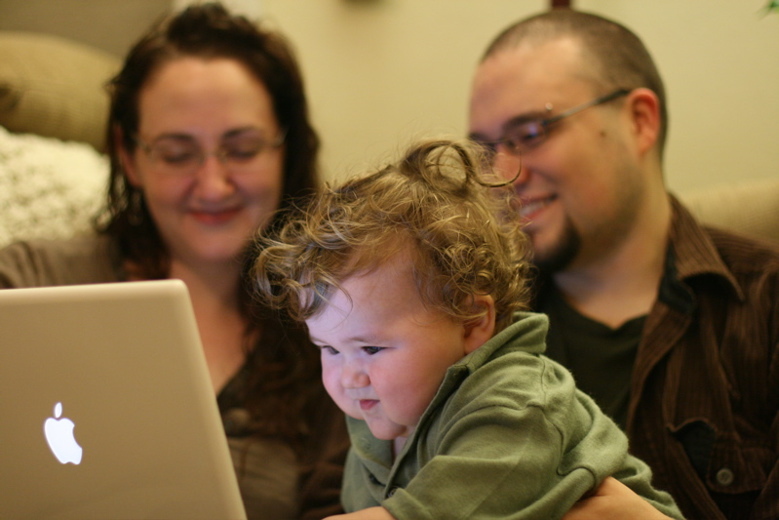 Such a great post on maintaining and boosting attachment, even with geographical distance. We are fortunate that most of our loved ones live nearby, but my husband travels out-of-town for work a lot and we rely heavily on FaceTime on the iPhone to keep in touch! I must admit we could do better when keeping in touch with my Mom. But as she's technically challenged, hard of hearing, and doesn't see that well. It's difficult. We send pictures, and we've visited a couple of times. I've also called her to say thanks for Christmas gifts. But that's about it. She lives pretty far away (627 km/389.6 miles), and she's too insecure to come here. So we go there. But it's only possible to go during vacations, to get any quality time. We were never that close, because we had a lot of disagreements as I grew up. So there's really no good foundation to the relationship. But We keep in touch anyway, because she's more 'tame' now, and our daughter has a right to know her maternal grandmother.